I have a friend that is literally collapsing, she's just 10% of herself most of the time. She would like to block the radiation from her smartmeter. I wonder, if you just block it like it shows, wouldn't it be still emitting radiation BEHIND (the screen just covers one side). What about behind the smart meter?? Some people have tried that smart meter guard, and found that it helps. The back of the meter is supposedly shielded by the metal box that meter is attached to. Marc, you're an angel. I'll tell her that. I just found this short video about a woman blocking her smart meter with thick aluminum foil. It seems it works! Re: Blocking meters with guards or aluminum, front &/or back, etc. : That does not take into account that the WIRES from the Meters CONNECT to the WIRES going to your Circuit Breaker Panel which connects to ALL the wiring in your domain, ceiling, walls, etc. Smart Meters turn all wiring into "radiating antennas" via the wires from the Meters to all your wires. Those front-guards would only block radiation emitting out the face of the meter; & any blocking on the wall behind the Meter will still not stop the Meter's radiating-WIRING transporting EMFs to your interior WIRING. The experts can explain it better. I first learned that from a Curtis Bennett, Electrician & EMF expert, interview. He basically said, in brief, "Everybody worries about the front of the meter but it's the wires BEHIND the meter that causes the problems..." etc. Site: ThermoGuy.com or twitter @RealThermoGuy. And Mr. Wm. S. Bathgate (WSB for short), Electrical Engineer, describes similar in his 2017 Interview (see my notes further below). WSB's interview also included FILTER FIXES/suggestions for Smart Meters, which is the main purpose of this post. I finally spoke with Mr. Bathgate last month 2018. Super nice guy. He will do phone consults $100/hour & does generous follow-up via email. Also, since his below 2017 interviews, he said he retired from his regular EE job & began his own DEfiltersLLC.com business. He said things have changed a lot in the DE filters world since his interview & that he spends his time testing all sorts of filters to combat DE. Unfortunately, it doesn't look good for me re any of the filters due to how this multi-unit building is built & grounded, grrr, & what it is made out of (concrete, rebar, steel, metal!! & some drywall). Whoever built it grounded the Smart Electric Meters to the underground REBAR + another grounding to the outer sidewall's inner STEEL. And, are your Meter pipes, from the Smart Meters to your Circuit Breaker Panel, running underground or overhead in your ceiling? Ditto powerlines... Are they overhead or underground? And find out where your "Water Service Entrance Pipe" is, & whether it is Metal or PVC. (Newer buildings, at least down here in the South, often have PVC.) See youtube about this further below. Mr. Bathgate said the more groundings there are, the WORSE for EMFs. Booo! Is Circuit Breaker Panel grounded? Here there are 2 ground "bars" (not "rods") in the Circuit Breaker Panel, plus the others to rebar & steel mentioned above. But if you're in a single family house or singular building, you could get relief via filtering. And that's probably who Mr. Bathgate had in mind when he gave the 2017 interview (& not us multi-unit dwellers). Disclaimer: I am not an affiliate for anybody nor any company mentioned in this post, including Mr. Bathgate. I have no financial motive for sharing this info. 1_"PEOPLE FEEL THE [Pulsed-MWR] PULSING, EVEN WITH OPT-OUT METER; FEEL IN THEIR BODY A PULSE/ PULSING; WHAT YOU ARE GETTING IS ALL THE SURROUNDING HOMES SENDING DATA, EVEN IF YOU DON'T HAVE A SMART METER. --"IN MIDDLE OF METER BOX IS A GROUND WIRE, FOR SAFETY GROUND. SO EVERY TIME THAT THING [Smart Meter] FIRES UP, THERE'S A RADIATION EMISSION, A MAGNETIC FIELD THAT GOES THROUGH THAT COPPER WIRE TO GROUND; THEY ARE ALL SENDING PULSES TO GROUND; SO THEY ARE BACKFEEDING[?] TO GROUND. --"PEOPLE HAD TO LEAVE THEIR HOMES BECAUSE OF IT. YOU CAN'T REVERSE THE HEALTH DAMAGE, YOU CAN ONLY AVOID IT. ONCE YOU ARE ELECTRO-SENSITIVE, THERE'S NO GOING BACK." --"BUY AN EMI GROUND FILTER MADE BY 'ONFILTER' AT WWW.ONFILTER.COM , MODEL #GLE30-1." --"We accept major credit cards and PayPal, as well as direct bank transfers - contact us for details." --"THIS PROVIDES A LINE FILTER ON THE GROUND LINE COMING INTO YOUR HOME. --"PUT IT BETWEEN GROUND ROD & YOUR SERVICE BIN." --"TO FIND OUT FOR CERTAIN WHETHER IT WILL WORK FOR YOU OR NOT, GO OUTSIDE (WHILE THE PULSING MAGNETIC FIELDS ARE STRONG), DISCONNECT THE GROUND WIRE FROM THE GROUND ROD & SEE IF YOU FEEL BETTER. --"IT REMOVES 90% OF THE PROBLEM." --"IT ONLY PROVIDES [blocking? inaudible] THE GROUND MAGNETIC FORCES THAT ARE SURROUNDING YOUR HOME & FROM ALL THE NEIGHBORS' HOMES' SMART METERS. --[With the EMI GROUND FILTER installed], "THE GROUND WIRE IS NO LONGER CAUSING RADIATION IN YOUR HOME." On Mar 29, 2018, "Bill Bathgate" wrote [to me/ED]: "This #GLE30-1 is a good device but since you are in a multi occupant building with the cement floor extending across multiple dwellings it will not likely be effective. If you are in an isolated building it can work very well." "Sadly, the majority of places that have a ground problem are buildings with a shared concrete foundation. When you bond the neutral to the ground, which again is connected to the [rebar] grid of the concrete foundation, you literally get currents EVERYWHERE!" --"THE OTHER THING THAT IS GOING ON IS THAT THE EMISSIONS FROM METERS, THERE'S AN FCC CLASSIFICATION CALLED 'CONDUCTED EMISSIONS' (THESE ARE NOT THE PULSED-MW-RF RADIATION EMISSIONS). --"WHICH IS CREATING OSCILLATIONS & TRANSIENTS ["Dirty Electricity”] ON YOUR INTERNAL POWER WIRES INSIDE YOUR HOME; WHICH TURNS YOUR ENTIRE HOME'S WIRING [in all circuits whether On or Off] INTO A RADIATING ANTENNA [surrounding you in every wall/ceiling that has wiring]. --"SOME PEOPLE SAY THIS IS WORSE THAN THE PULSING. --"PUT EMI/EMC FILTERS ON THE POWER WIRES COMING INTO THE CIRCUIT PANEL. --"A. SCHAFFNER COMPANY, A FILTER USED FOR SOLAR PANEL INVERTERS THAT MEETS THE SPECIFICATIONS FOR FCC CLASS-B CERTIFICATION; THAT'S WHAT YOU'RE LOOKING FOR, FCC CLASS-B CERTIFICATION EMI/EMC FILTERS, POWER FILTERS, THIS MODEL WORKS PRETTY WELL, FN2200, FULL POWER LINE CONDITIONER[? inaudible], NOT JUST THE CIRCUIT ... UP TO 2500 AMPS. --There's no direct URL for their INDIVIDUAL products; no pricing online & no way to shop their site online either. "Latest update" [on their homepage 2017 said]: "We will present a new Active EMI Filtering Technology at the forthcoming 2017 IEEE Symposium on Electromagnetic Compatibility, which will be held next 7-11- August 2017 in Washington DC. Check it out here! " --"B. ANOTHER AVAILABLE OPTION IS FROM THIS COMPANY, THEY'VE BEEN AROUND A LONG TIME: ETS-LINDGREN, THEY MAKE A ***FULL HOUSE*** POWER LINE FILTER; HIRE ELECTRICIAN. CALL MAKE SURE, LRX OR LPRX FILTER, THEY WORK VERY WELL, THAT'S THE BEST ONE OUT THERE, BUT IT'S NOT CHEAP, $2,000! [or did he say $10,000?] IT DOES WORK." --[Me: Their FILTER EXPERT is named SERGIO] @ <a href="tel:512-531-6433" x-apple-data-detectors="true" x-apple-data-detectors-type="telephone" x-apple-data-detectors-result="27/0">512-531-6433. Me.1: Beware, the above LPRX & LFPRX "full house" filters are VERY EXPENSIVE & VERY HEAVY: $9,500-$10,000 & they weigh 100-200 POUNDS for shipping! And, no, I didn't buy any but I would (charge it!) if they would work in a multi-unit building because it's that bad here, grrr. Mr. Bathgate said on the phone to me last month (2018) that the reason they are so pricey-dicey & heavy is because "They have IN them EVERYTHING you could EVER need." Me.2: Consider looking at Mr. Bathgate's new site, DEfiltersLLC.com. He has cheaper DE filters. Me.3: Another also pricey filters option: I heard/read this elsewhere in 2017 subsequent to Mr. Bathgate's interviews, which, per a comment, said these are, supposedly, the ONLY ones that “REALLY REALLY WORK” because they are “MILITARY GRADE” FILTERS that are “placed at the breaker box area,” but are also very expensive > $5,000 to $10,000. This site is way over my head. Me: I noticed way down in the "Live in a Cave" thread @ ES-Forum that some of the guys were discussing filters. I'm not sure if they are the same kind but maybe those gents will visit this thread & add their opinions re these filters. I am no expert on the subject. --Mr. Bathgate said he lives in sort-of a “cul de sac” area that includes 12 homes. Nine of the owners agreed to get/install the filters, but three did not. But he said even with just nine doing it, they are doing well there, not having the two problems. --Bathgate BRIEFLY mentioned a lady who lives in a mobile home (metal box) with a smart meter, & he said, “You can just IMAGINE how BAD that would be!” (since MW-RF radiation “interacts with & reflects off of metal”! per expert Curtis Bennett at ThermoGuy.com). --Bathgate also told of another lady he knew of who gave up & killed herself due to the relentless Smart Meter torture. --Re: Smart Meters causing fires, Mr. Bathgate said: "HAVE METER REMOVED FROM BLDG. & PUT ELSEWHERE ON PROPERTY TO PREVENT BLDG. FIRE. --"OR, COULD PUT A CIRCUIT BREAKER BETWEEN SMART METER & WHERE POWER COMES IN; BUT UTILITIES WON'T ALLOW, THEY ARE AFRAID OF CHEATERS STEALING ELECTRICITY." If your "Water Service Entrance Pipe" is metal, all the bad stuff from Smart Meters can enter your home through your water pipes. Me: I would recommend reading all the comments as well. Some said PEX may leak chemicals into the water & that PVC is better. 1_Billing Errors, Why, & How Smart Meters cause billing increases. "They will be sued to EXTINCTION!" ED.vs.EMR , thank you for your all your valuable links. That's it seems where all our problems started : we lost touch with the ground, and with common sense consequently. People even believe these days that the earth rotates around the sun instead of vice versa, which is a pretty odd perspective. Of course it depends on what one defines as the center of the universe (-s), but the earth is where we are now. Hi earthworm, you're very welcome! Hope the info will be helpful to someone. Hard-surface sleeping is also supposedly good for bad backs. I know any beds with metal are bad news now with all the EMFs, etc. "Paracelsus, byname of Philippus Aureolus Theophrastus Bombastus von Hohenheim, (born November 11 or December 17, 1493, Einsiedeln, Switzerland—died September 24, 1541, Salzburg, Archbishopric of Salzburg [now in Austria]), German-Swiss physician and alchemist who established the role of chemistry in medicine." As for what rotates around what in the Universe, it's all I can do to cope with "down here." :) Possibly the Commies are spreading disinfo in order to "rewrite history" which they are famous for doing. I am truly sorry to hear about your friend and would like to provide some additional information for her as well as you. I am not here with an agenda or sales of any kind, I was part of a team that did an extensive investigation into wireless EMFs as applied because of my background. I have electrical credentials provided by governments and Industry Canada recognized across Canada. Those credentials are for the utilization of all electricity produced in Canada. We are the utility's recognized expert, therefore the Utility's Commission in each provinces expert. It took minutes after hearing about Wi-Fi and wireless smart meters to say, "they can't do that, you would be putting classrooms, homeowners, cities and ecosystems inside the wireless electrical circuit. Health Canada as the authority having jurisdiction referred me to exposure code Safety Code 6(2009) The first 9 pages of the code set off alarm bells because the code is to protect the public and establish limits of human exposure. The purpose of the code spoke of limiting contact and induced currents when there are no circumstances where inducing currents into anybody would be allowed. It is current that kills. Safety Code 6 admitted causation and biological plausibility was missing linking RF EMFs to adverse health effects. Cause is how are the EMFs hitting you and they left out the grid. The plastic head doesn't have any biology, as soon as you incorporate all the bio-electrical information associated with humans you have plausibility. The reason they called it sensitivity of any kind is because some felt it and others did not. That was reflected in the mysterious weapon used in Cuba to attack US and Canadian Embassy Staff. US agencies thought it was a directed acoustic weapon because some people in the room heard it, felt it and some had brain injuries as well as concussions. If your friend had a plastic head, she would not be hurt. It is really horrific what has been allowed to happen with the mass deployment of wireless as applied. I was a Registered Intervener in FortisBC's application to the BCUC for wireless smart meters. I cross examined FortisBC experts and Exponent Inc's Dr. William Bailey as well as Electrical Engineer Yakov Shkolnikov for 3.5 hours. FortisBC lawyers chose not to cross examine me even though I opened with looking forward to being cross examined. FortisBC expert's admissions under oath pinned them down on the causal and biological evidence. Their application will be reversed as will BC Hydro. These RF EMFs are not supposed to hit people or it triggers nerves and muscles. Medical professionals expanded on that by stating the nervous, hormonal and immune systems will be compromised at the same time. Inducing electrical current means increasing cellular voltages where .2 millionths of 1 volt increase changes white blood cells. Your friend also has high speed oscillations inside the body billions of times per second. The EMFs are changing frequencies in her brain and she is in trouble. She has been put in a man made microwave oven on low. You and your friend as well as others need to know that the missing causal evidence linking RF EMFs to adverse health effects was found, reported and lectured for Continuing Medical Education credits required for ongoing medical licensing. That advanced medical education is applicable to all health professionals in North America and will be global. As soon as your friend and others shows their doctor that RF damage was lectured for CME credits, it changes the game for them. Follow all links, these documents don't sell anything. Others should expand on them and when your lawyers find out you have big lawsuits for this crime, they will help. Thank you all for your concerns with my friend. My house is in Switzerland, there is no problem yet (no smart meter). My friend lives in the US, and she's got a smart meter..... and she's very ill.
She's been to dozens of MDs, specialists, up to now, no one could really help her recover her health. I suggested her, that she might be ill from electrosmog. It was then, she mentioned the smart meter. Her symptoms started worsening after she used the laptop, that's why I guessed. She went to see an alternative MD, and he said her worse problem was electrosmog. Since she blocked her smartmeter, and tried to do earthing, nothing seemed to improve, at least, not in the initial days.... I have to contact her again and ask her. Thank you all for the websites and information. It's crazy the world we are in. Bennett says that it is the ELECTRIC current that kills. I don't really understand that, as far as I understand, there are no electric currents hitting my body, right? Here is 9 minute documentary where doctors attach electrodes to a brain of a driver (who is also a medical doctor), while he drives. 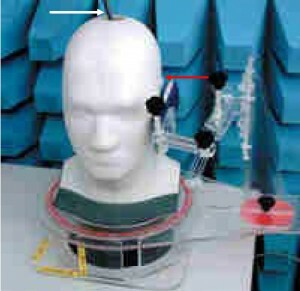 It's in German, but you can just scroll it to see the image of an EEG (electroencephalogram) of the driver. It's unbelievable what happens to the brain waves!!! I also just read a book today, from another German alternative medical doctor, about allergies. He explained how allergies start through electrosmog too, and also mentioned the problem with white blood cells (like you mentioned). I did not understand: in the end, the Canadian government DID or DID NOT allow smart meters in classrooms, houses, cities? There are smart meters and smart meters.. they're not all equal. I've seen some emit 24/7 and some that emit once a day, others emit once an hour, etc. Your friend has no chance to figure out the problem until they get a EMF meter. Just because there is a smart meter doesn't necessarily mean it's causing the problems. Nearby cell towers usually emit a lot more than smart meters will. You have to measure measure measure.. Sounds like your friend is spending a lot of $$, she could just hire somebody to do an EMF inspection.. there are soo many things to test.. appliances, light bulbs, computer, wifi, neighbor wifis/radiation, cell towers, home wiring errors, mold, and I'm sure I'm missing a whole bunch here but there's a start. I'm in Canada, we got smart meters everywhere!.. I don't know if in classrooms, but it wouldn't be illegal.. They have wifi in classrooms already, so smart meters that emit once a day at some AM time wouldn't even cause any radiation increase.